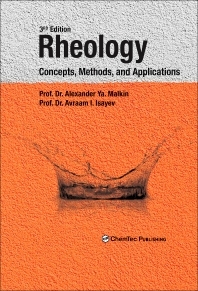 Rheology: Concepts, Methods and Applications, Third Edition provides a thorough historical and theoretical grounding in the field, and introduces rheology as the method of solving many practical problems in materials science and engineering. The book is practical and relevant for industry, but is also consistent with rheology courses in academia, making it relevant to both academics and accomplished rheologists in industry. The first four chapters discuss various aspects of theoretical rheology and, through examples from numerous studies, show how particular theories, models, or equations can be used in solving different problems. The shared experience and insight contained in these chapters assists practitioners carrying out rheological studies in generating relevant data. This helps to avert costly errors in analysis which are common when data are generated under the wrong conditions, or are incorrectly used. The fifth chapter covers methods of measurement and treatment of raw data—eight groups of methods are discussed in this chapter, providing the reader with many options for experimentation, along with guidance on where and how to use them properly. The final chapter demonstrates how to use rheological methods for different groups of products and manufacturing methods. The usefulness of chemorheological (rheokinetical) measurements is also emphasized. The chapter has a particular emphasis on real-world applications of rheology, and gives practical guidance to enable materials scientists to gather data and solve problems using these methods. This book is a systematic presentation of the subject of rheology—written by two of the foremost researchers in the field—showing the subject as an interrelated system of concepts, principal phenomena, experimental methods, and directions of their application. It also links with other branches of theoretical and applied sciences. Prof. Dr. Alexander Yakovelich Malkin is the Principal Research Fellow at the Topchiev Institute of Petrochemical Synthesis, Russian Academy of Sciences, Moscow. He has written five monographs and more than 100 papers in English, including three books on the subject of rheology. He has also taken part as an invited plenary or keynote speaker at numerous international conferences and meetings on rheology, polymer processing and physics. Prof. Dr. Avraam I. Isayev is a Distinguished Professor Emeritus in the Department of Polymer Engineering at the University of Akron, USA. He has been a member of the Society of Rheology since 1981, and a Senior Member of the Society of Plastics Engineers since 1984. His interests include polymer processing, rheology of polymers, and the injection, co-injection, transfer, compression and gas-assisted injection molding of polymers.